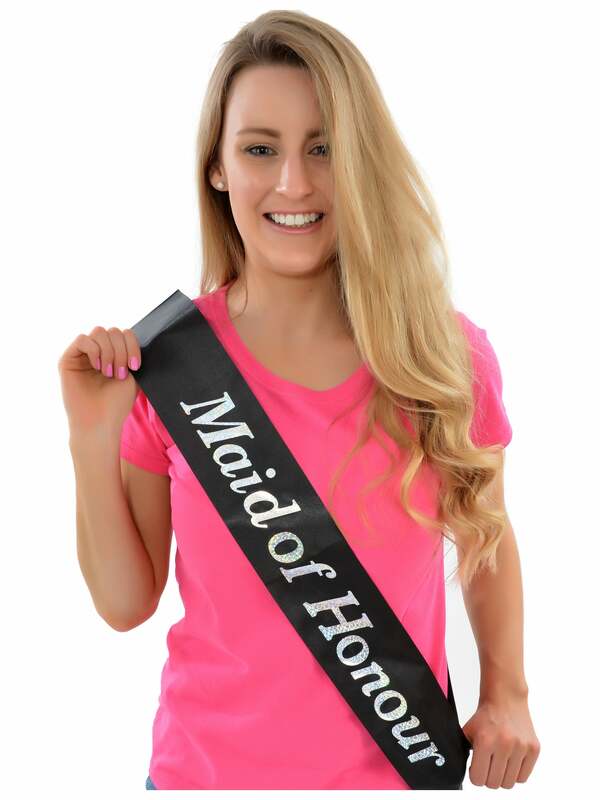 Make sure everyone knows who the head bridesmaid is with this amazing Maid of Honour Hen Party Black Sash. Combine with your existing outfit or fancy dress costume or go all out and coordinate with the Bride to Be! Perfect for Hen Parties, wedding rehearsals or pre-wedding meals. This Maid of Honour sash is jet black and features striking bold silver text and will fit comfortably over most costumes and outfits. Why not add a tiara, rosette, drinking game or a T-Shirt to complete your order? Hen Party Superstore offer a range of delivery option, including Next Day and Saturday delivery so that you can get your perfect accessory even at short notice. Review - Ordered for my maid of honour, very good service. Quick and easy and very good quality. Also ordered the mother of the bride and 12 more of the hen party ones. Ordered for my maid of honour, very good service. Quick and easy and very good quality. Also ordered the mother of the bride and 12 more of the hen party ones.